BeautyH2T: Sure Maximum Protection Deodorant- worth the hype? Sure Maximum Protection Deodorant- worth the hype? Deodorant is not something I would usually be that keen to get up on the blog as soon as possible but this is different! 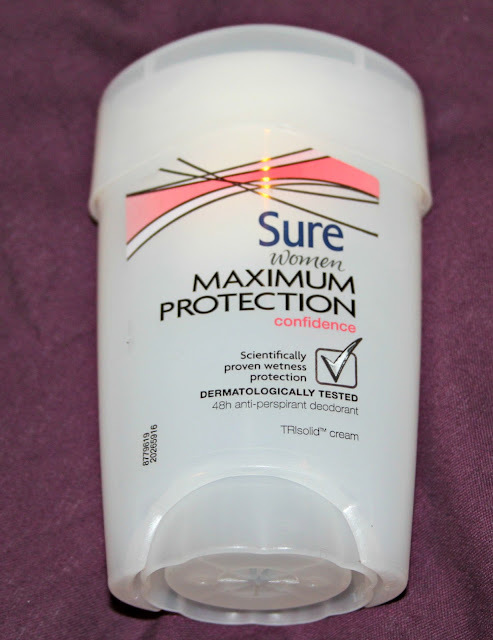 I had seen the Sure maximum protection cream popping up on various blogs in the last few weeks and didn’t think anything of it, I just thought pah how good can a deodorant be?? I could not have been more wrong- this is hands down the most amazing thing I have ever used and it has been a total blessing for me! I am not afraid to admit that I often find myself feeling sticky and wet after a long day, a commute and a gym visit and although what I was using before kept me smelling ok I still felt uncomfortable and itching to shower by the end of the day. Then after deciding to see what all the hype was about I shelled out that what seemed massive £5.30 for a deodorant and I doubt I will look back! From the moment I put it on I was in love, I can honestly say that I have never felt so comfortable and clean for the entirety of a full day and night before! So much so I have been waving my armpits in my poor boyfriends face and yelling 'see how dry I am!' at him. Lucky guy. If like me you are a pure sweaty betty in the summer months, or are just paranoid about it, I would one hundred percent give this a try- yes it seems like a lot to pay for a deodorant but it could not be more worth it! I am in no way affiliated with Sure in any way- i just had to share what is a total wonder product in my eyes.! Introduced to the Dove (pomegranate) version of this by a bloke, would you believe, and whilst the price is way higher than I would normally pay for deodorant, it's well worth it. Lasted a month for me so I'm off to try the Sure version now as the Dove one was a bit too sweet. thanks for the post!